The day began at 9.30 am with the coach’s first pick-up and by 10.30 am everyone had gathered in the Café at the Harris to enjoy a cup of coffee. Everyone then went on a guided Fine Art tour. The group I was in was shown round by Stephen who was so interesting because he was passionate about the Harris and everything within. We were very impressed with the beautiful friezes round the walls in the centre room on the Ground Floor and the fabulous ‘Gate to Heaven’, a magnificent copy of the famous one in Florence. We had asked if we could see any of their Richard Ansdell’s on display and saw one of Lytham, ‘Lytham Sand Hills’, he painted many such beach scenes. We also saw his impressive ‘Death of Sir William Lambton at the Battle of Marston Moor’. The white stallion featured in this painting illustrated what we know, that Ansdell was a fantastic painter of animals. The other memorable painting we were shown was the Harris’s ‘Pauline in the Yellow Dress’. Stephen told us the story behind it. Sir James Gunn, 1893-1964, painted it and it was a labour of love as the subject was his second wife whom he adored. There was never any intention to sell it but to hang it in their home. He was persuaded however to submit it to the Royal Academy where it became picture of the year and later the Trust at the Harris paid a lot of money for it. After lunch we all headed for the nearby Conservation Studios where Heather Davis (Conservation & Collections Manager) welcomed us. For the benefit of those who had never been to the Studios before, Heather gave a brief history of how they had come into being and what we could expect to see during our guided tour of all the different departments. She told us that the Lancashire Museum Service opened in 1974. The lovely St Mary’s Church, which houses the Conservation Studios, was very nearly flattened to become a car park but was saved and became the Studios in 2003. Complete with conservation studios, it now employs seventeen people, half of whom are conservators. Heather also briefly updated us on the situation of some of the local museums. She said that in Preston, a military organisation was taking over the running of it, whilst volunteers had organised the management of the one in Fleetwood. The Judges Lodgings had a new Friends Group and two others were hopeful that a National Organisation would save them. Our tour began in the paper department where Heather showed us a block of nine of the Turner Prints which we will be able to see in the Fylde Gallery in the forthcoming exhibition, ‘Turner and his Contemporaries’, June 22 to August 6 (see the Visit Gallery page). They are all being cleaned, remounted and framed. An odd one would be left in its present condition to show the difference, before and after. Interestingly, she explained what ‘foxing’, those brown spots which develop on old paper, is. They are formed when microscopic metal particles, present when paper is made, rust over the years. They are treatable. Lucy, the conservator in this department, showed us the skeleton of a wolf, found originally in a cave near Kendal, which had been badly mounted on a frame. Treatment had been to take it apart, clean it and put back together again correctly with a stronger mount. There was also a boar’s head from the Clitheroe area, which was mounted on a wooden barrow. This belonged to a pub where, over the years, it has been used as a centre of activity. Here, we were overawed with the spectacle of Alcina, our beautiful, white marble bust which the Friends are having restored with the money donated to us by Ivan Midgley. We have waited for the right artwork to come along to use his gift and this is it. How lovely it was to see it from every angle and study the incredible detail instead of it being against a wall, which limited your appreciation of it. Jenny, the conservator, told us the work necessary would take approximately twenty-seven hours. She said she had already done some repair work and cleaned a small patch where we could see how very white it would become. There was a lot of surface dust which would probably be laser cleaned. This method makes the dust particles vibrate and loosen. Some steam cleaning might be used too. Alcina was sculpted by F S Francini in 1880 and donated to the Collection by Alderman J H Dawson in March 1956. To demonstrate the diversity of objects dealt with at the Studios, Jenny showed us the small model of a boat with figures she was working on. It was excavated in the 1920’s, originally from Egypt, and probably about 4,000 years old. Apparently there is a lot of interest in Egyptology in the North West. Phillip Bourne and Janice Porter both showed us round this department. Many of you will have met them at Friends’ events, mainly at the Town Hall when they have talked to us about their work. Janice has retired since our trip after working as a conservator for over 40 years and at the Studios since 2001. A painting due to be exhibited at Tate Britain was being worked on. It had flood damage and tide marks were visible on both the frame and the painting. Work to be done in a case like this depended very much on the action of the individuals who rescued the item, how quickly they acted and what they did. Janice described the work being done on an Heraldic Panel from a church. This huge, square, wooden panel, dated 1695, had woodworm, was dirty, damaged, had had several layers of varnish applied over the years and was very discoloured. A decision is often made as to how much attempt there should be to repair some damage as it can be considered part of its history. Phillip then showed us ‘Penelope’, our oil on canvas painting by Alfred Louis Andrieux (1879-1945), which is being conserved by the Friends helped by money donated by James Hilton. 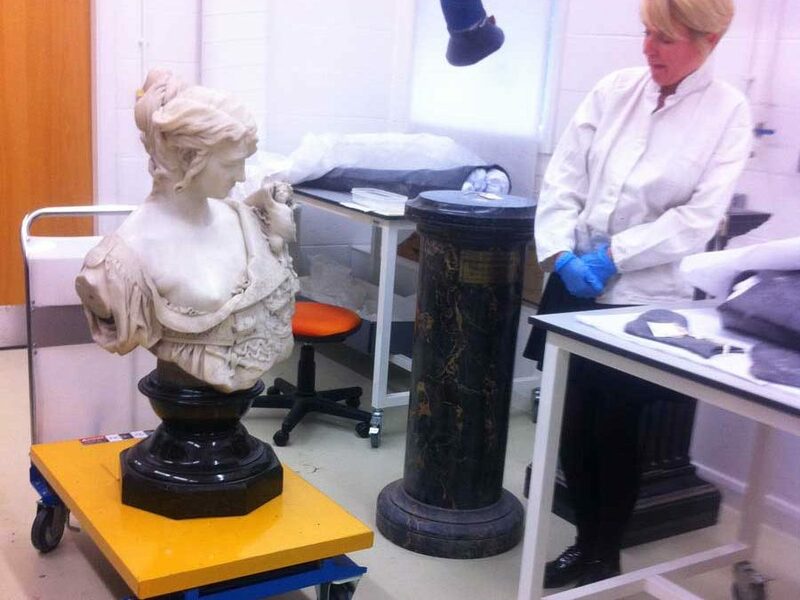 It will take approximately 90 hours to complete the conservation process. There were dirty brown patches, some of which had been cleaned revealing a beautiful blue sky. There was a lot of black surface dirt, a thin layer of varnish and a lot of cracking. There was also what they call ‘cupping’ which describes the curling upwards from the cracks. This can be treated with controlled moisture using a vacuum. It was a memorable day. Places on trips to the Studios are always much in demand, they sold out on this one in the first week. More will be organised in the future.